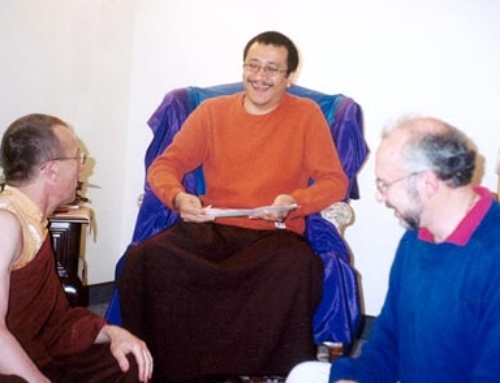 This spring, the Vidyadhara’s nephew, Karma Senge Rinpoche, returned to Canada for the fourth time to teach and translate with us. The focus this time was on a very important transmission:The Sadhana of Nonmeditation: A Practice of No Activity, Drawn from “The Heart Treasure of Samantabhadra”—an ati terma discovered by the Vidyadhara in Kyere, Tibet. From the start, we shifted into a higher gear all around. We had translated and compiled all the liturgies and commentarial texts we thought necessary before the visit began, working for nearly two months last winter with Surmang Khenpo. However, soon after Rinpoche’s arrival we discovered that there was much more to translate, and we completed new drafts of all the most essential pieces in a matter of days, completing two publications (sadhana and practice commentary) just in time for the program. 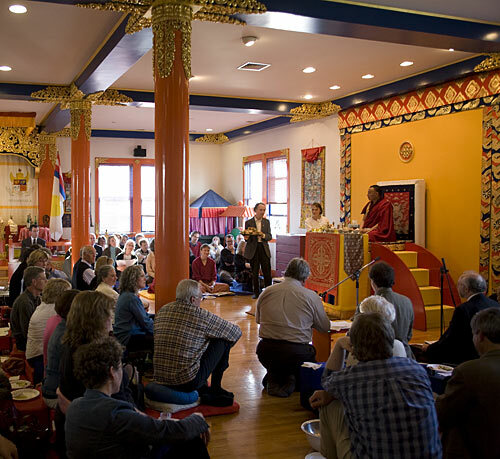 For more on our work with Karma Senge Rinpoche, please see Projects: 2007. We thought you might appreciate a different voice in reporting on this empowerment, and so we asked a good friend and writer, Denny Blouin, to put his mind and heart and hand to this. From the distance of print and secondhand story all of that is relatively comprehensible. But now it comes as a mind-bending surprise to hear—not just to read—of his activity as a tertön in Tibet, receiving and uncovering both earth and mind termas on Kyere Shelkar mountain, at the place Padmasambhava named Luminosity Sky Palace, declared by him to have more blessings than other sacred pure lands. Trained as the first generation of Trungpa Rinpoche’s students, we were taught to cut through the “love and light” and “magic and mystery” attributed to Tibetan Buddhism, and to come down to earth and perceive ordinary magic. Because of that, his actions as a child tertön challenge our practiced skepticism. But what he did was actual, witnessed fact in the original meaning of that word: thing done. 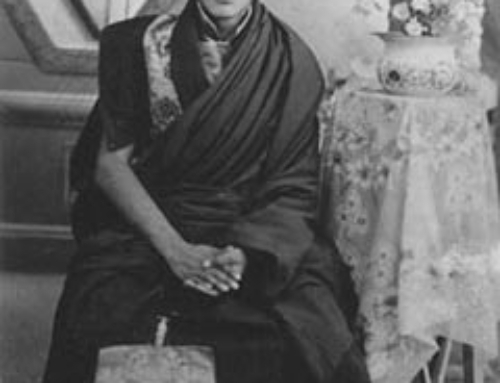 At still another time when Rinpoche was at Kyere monastery, during a group ganachakra practice, again at dawn, he encountered Ekajati “face to face.” She with her big spike topknot, single breast and fang, her heart-eating Mahakala face, wasp-waist and skull garland, she “with a terrifying roar of laughter, amidst swirling fire and wind, red and black, placed in his hand a treasure casket, which on the following day opened by itself.” That treasure contained a practice of Ekajati; sadhanas of the guru, yidam, dakini, and dharma protector; prophecies about the future, and this very profound Avalokiteshvara sadhana, which includes a method of practicing effortless nonmeditation. There will be no time to do a practice involving effort. Even practicing will be a great risk for one’s life. Therefore, you should practice ati, effortlessness. By the time Trungpa Rinpoche received this terma in 1958, simply to be seen reciting mantras or using a mala, let alone practicing meditation, had become crimes in regions of Tibet the Chinese had conquered. Thus only the effortlessness of ati would be an undetectably safe practice, which may explain why his teacher Khenpo Gangshar broke the traditional mold for dzokchen transmission by giving it publicly to large gatherings. 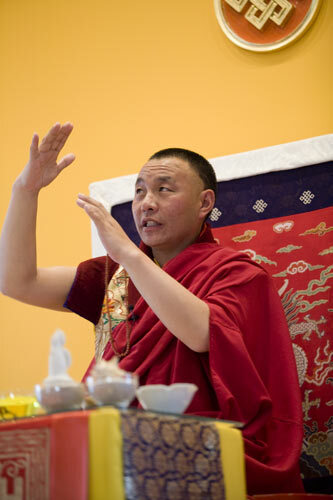 Karma Senge Rinpoche in Halifax Shambhala Center Shrine room. Photo by Marvin Moore. All 240 of us, packed quite tightly into the shrine room in what came to feel like a family gathering of the Vidyadhara’s sangha, still sharp, soft, salty, vital, quick with questions and service. But coming just three months after Molly Nudell’s Sukhavati, and with Robin sitting with many of us for the last time, sartorially ever-resplendent, but walking with a cane and nodding off due to medication—a life-risk decision to attend—the weekend cut two ways, with both a sense of loss and urgency. Loss in the sense that seats in the shrine room are now open, as the foundation generation of the sangha begins to lose its members more frequently. But at the same time, when Jessie Litven, 26, took her seat as an oral translator and began to learn on the job in front of us all, clearly a hot torch was being passed. In memory of Robin Kornman.